Croyde is a paradise for children, who have for their enjoyment a fine stretch of sands, perfectly safe, they can gallop on horseback with perfect safety over these sands, surf in the breakers, search in the rock pools for prawns and small fish and play in the sand dunes. Woolacombe and Saunton, farther south, are the only other places on the North Devon coast where such sands are found. Surfing is excellent and is very popular. The beach is a fine flat sandy one with room for every ones beach games. Surfers use this bay and life guards are here during the season. There are rock pools, but not a lot of shelter if the weather turns. The usual facilities can be found here, bar, cafe, toilets. 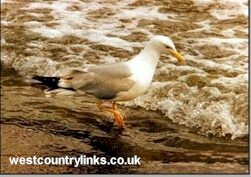 Devon holidays, Cottages, Caravan Holiday Parks, Camping, shows, festivals, attractions and events Devon.